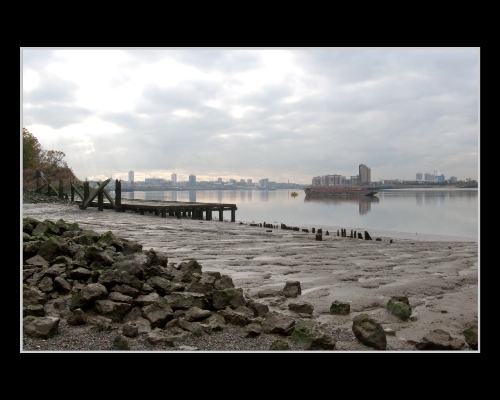 Members of the Thames Discovery Programme, along with local archaeologist Andy Brockman, took a trip to the Woolwich foreshore at Gallions Reach on Wednesday 28th October. The site, part of the former Royal Arsenal, revealed a wealth of archaeological features including prehistoric peat beds; Roman pottery fragments; remains of wharves and river defences dating back to at least 1720; and a WW2 mine-watchers post. The main feature of the site was a river access facility to the arsenal comprising a massive timber gridiron, a rail-bed set on timber baulks and a concrete wall with iron gates which led into the arsenal site. With such an abundance of archaeological features it is hoped that Gallions Reach will be adopted as a future TDP site.